Megabass Hyper Cork Knobs [Megabass Hyper Cork Knobs] - $30.00 : The Tackle Trap, Inc., It's all about fishing tackle!
. 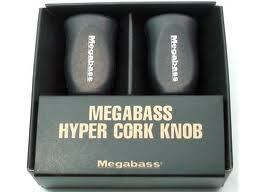 Brand new Megabass Hyper Cork Knobs! These knobs are a great addition to any Daiwa reel and look great on both EVA and Cork handle rods. Get yours before they're gone again!